Camas County residents will have an opportunity to provide public comment to the county commissioners on a proposed ordinance that would increase landowners' rights to build on hilltops and ridges. 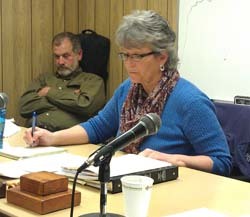 During a commissioners meeting Monday, commission Chair Janet Croner called for a public hearing to take comments on a proposed ordinance that would overturn a 10-year-old "hilltop ordinance" similar to Blaine County's, which favors the rights of neighbors and passersby to have unrestricted views of natural hillside scenery. The commission had been given taped comments on the issue gathered from residents by county staff, but Croner insisted that a public hearing take place. "I don't want to listen to tapes. I want them to talk to me," she said. "We may get different input at a governmental level." A temporary restraining order was issued last summer by 5th District Judge Robert Elgee to stop construction of a building belonging to Merlyn Colpron, which was allegedly permitted in violation of the current hillside ordinance. Colpron said in an interview Monday that he chose not to fight the lawsuit, and that he would be allowed to continue his project if the new law is passed. "It's cheaper to dismiss [the suit] than to fight it," he said. The new ordinance was written last summer by Camas County Building Inspector and Planning Administrator Dwight Butlin, after Elgee's court order. Butlin said he wrote the ordinance because it discriminated against some landowners. Croner's insistence on a public hearing aggravated Commissioners Bill Davis and Ken Backstrom, who said at Monday's meeting that enough public comment had been taken during two Planning and Zoning Commission hearings in recent months. Both commissioners indicated that they would vote in favor of the new ordinance, which would eliminate restrictions placed by the current ordinance on building on ridges above 5,200 feet in elevation. Backstrom said if the county experienced a "growth spurt" resulting in numerous "eyesore" homes being built on ridges, the commission could consider repealing or amending the new ordinance. "To build at all on hilltops is ugly for some. For others it's beautiful," he said. The public hearing will take place on Thursday, May 10, at 7 p.m. at the Fairfield senior center. - The Fairfield City Council will meet Thursday, April 19, at 7 p.m. at City Hall to consider a sign ordinance, which would establish standards for the fabrication, erection and use of signs within the city.